While feeling safe in our own home is something many of us take for granted, for anybody with hearing loss this may not be the case. The Bellman Safe Value Pack combines a smoke detector, alarm clock, and bed shaker to reduce the worry of not being able to hear traditional alarms, providing instead a vibration alert. How Does the Safe Value Pack Work? The Safe Value Pack features three components that work together to provide peace of mind that alerts can be detected when alarms sound. When activated, the smoke detector sends a signal to the alarm clock, and the bed shaker that is connected to the back of the clock will vibrate to provide a physical prompt. This bed shaker is compact enough to be able to be placed underneath a pillow without causing discomfort. This means that it can be positioned near the head for more easily detecting when it is vibrating, providing reassurance that a sound night of sleep can be enjoyed without worrying that the smoke detector will go unnoticed should it be set off. 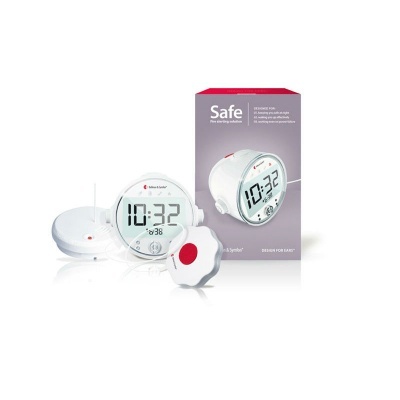 The Safe Value Pack can also be connected to other transmitters such as doorbells, telephones, and baby monitors for a more multipurpose alert system. These additional transmitters can be purchased separately. Who Can Benefit from the Safe Value Pack? The Safe Value Pack is primarily designed for deaf people or anybody with hearing loss. The vibration pad that is placed under the pillow provides an essential physical prompt in situations where audial alarms cannot be heard. The pack will also be ideal for anybody wishing for an additional indicator if they are worried about not being able to hear alarms or wake up quickly enough when only a sound alarm is used. By using the combination of smoke detector, alarm clock, and bed shaker, you can rest assured that you have taken every step possible to increase your safety should a fire break out in the middle of the night.